There are some good things about the winter. One is certainly the supply of really good mussels. And to a fair price as well. Mussels are perfect if you have invited guests. It is prepared in a sec, tastes wonderful and it makes fun to get together around the pot. The only problem is that you need a huge pot if you are more than 4 at the table. If you only eat mussels I recommend 3 kg for 4 persons. Clean the mussels and make sure everyone closes when you give them a knock. If not, throw away. Fry the curry, shalots, garlic and celeriac gently for 3 min. Pour the beer and let it boil. Add mussels and steam under a lid until the mussels are opened (app. 5 min). 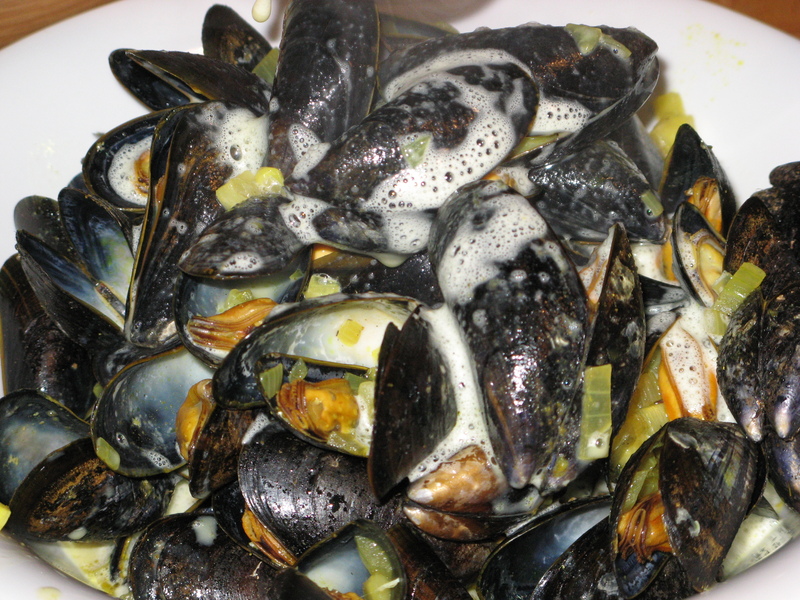 Remove the mussels from the sauce. If any mussels have not opened, throw them away. Add the cream to the mussels sauce and cook for 3 min. Flavour with pepper and salt if needed. Pour the sauce on top of the mussels and garnish with parsley. Enjoy with a good white bread or fries. Sailor’s beef was first documented in Sweden at the beginning of the 19th century. It is an easy course to make and that is the reason why it was possible to make it at sea. Peel and slice the potatoes, fry the onion rings in butter in a pan – not to hard only so that they get soft. Fry the meat in the pan until it has colour, add salt and pepper to the meat. Use a cast iron pot and make 2-3 layers of potatoes, onion and meat. Pour the water in to the recently used pan and whisk out the flavours from frying onion and meat. Pour the fluid in the pot together with the beer. Add bay leaves. Let come to a boil and let simmer until the meat is tender, approximately 1 hour. Serve with chopped parsley and sliced pickled gherkin. Enjoy! In the autumn it is time for crayfish parties all over Sweden. We had excellent timing this year and had already planned an autumn journey to Sweden to attend a wedding and visit friends and family. If you don’t get a hold of fresh crayfish you can always but frozen at IKEA all over the world. This is a crayfish party according to the Schmidts! Blend all the ingredients together, except for the heads of dill. Make sure that the salt and the sugar dissolve. Then put the crayfish and the heads of dill in layers and pour the fluid over. Let draw for at least an hour. You need to eat a lot of crayfish to get full. All snaps make it hard to survive the evening without having something satisfying. This delicious pie help you overcome the evening. Start with the pastry, mix butter and flour together. Use an electric mixer if you have one. Add water and salt. Press out the pastry in a pie dish and let it rest in the fridge for about 30 minutes. In the meantime, fry the chanterelle and the onion in butter. Whisk the egg yolks, milk, cream and the spices together, grate the cheese. Fill your pie dish with the chanterelle and onion, pour over the milk mixture and finally sprinkle the cheese on top. Bake in oven at 200 degrees Celsius, for 35-40 minutes. Besides beer we also have a snaps or two to our crayfish. A very popular snaps is the Norwegian Linie Aquavit. 1805 the Norwegians sent a ship with snaps, stored in barrels, to Australia. Unfortunately the company that were receiving the snaps faced bankruptcy and the snaps were sent back to Norway. When it returned the Norwegians thought that the snaps tasted even better than before and from 1842 the Lysholms Linie Aquavit always passes the equator (the line) in a ships before it is filled into bottles and sold. Music: The crayfish party were accompanied by our own horse and raucous voices, singing Swedish snappsvisor (snaps songs).